With the Player Retention for the 11th season of Indian Premier League (IPL 2018) is all set to go on January 4 in Mumbai. The franchise has the option to retain five players with the combination of Pre-Auction Retention and Right-To-Match (RTM). 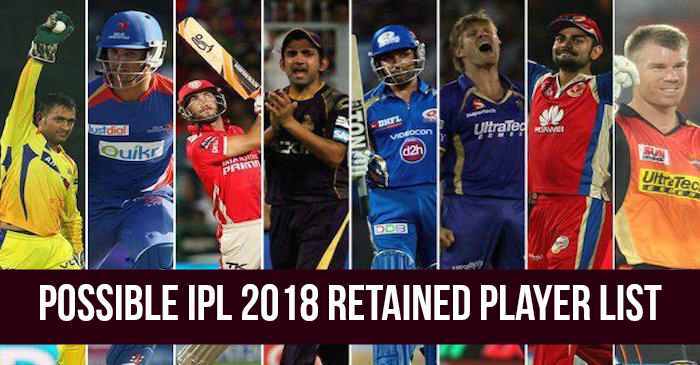 As January 4 is the last date for Pre-Auction retention an IPL 2018 Player Retention Event has been organised in Mumbai, which will be live broadcast on Star Sports Network. The first time an IPL Player Retention Event has been organised, earlier it was done through exchanging email between Board of Control for Cricket in India (BCCI) and the team franchise. Chennai Super Kings is going to retain Mahendra Singh Dhoni and Suresh Raina. There is still a final decision to be taken on the third player. It can be Ravindra Jadeja or Ravichandran Ashwin; who among these are retained or both are dropped. CSK may also go with some unpredicted name. We are working on a number of combinations and permutations. The strategy is to get all our key players back and form a strong combination that we have always been. It may be, or may not be Jadeja. Two names which are doing rounds in media reports that can be retained by Delhi Daredevils are Rishabh Pant and Shreyas Iyer. According to Virender Sehwag Kings XI Punjab are only going to retain one player from Glenn Maxwell, David Miller, Hashim Amla, Sandeep Sharma or Mohit Sharma as their choices. And planning to use RTM card. We are planning to retain one player and use our Right To Match (RTM) cards for players who have done well for us like Glenn Maxwell, David Miller, Hashim Amla, Sandeep Sharma or Mohit Sharma. We are planning to use all our RTM cards. We would like to pick new talent. We have done it in the past with Sandeep Sharma or Axar Patel. Kolkata Knight Riders are bringing Gautam Gambhir under the hammer by not retaining him. And KKR may probably go with two International players Sunil Narine and Chris Lynn. KKR is planning to buy Gautam Gambhir in auction or use Right-To-Match (RTM) cards. Gautam (Gambhir) has been a key constituent of KKR’s IPL success. Not retaining him is a strategic move. This does not mean KKR is not interested in its most respected team member. We always have an option to bid for him in the auction. We have the privilege of the Right-To-Match. So it will not be fair to say that he is out of our future plans. Gautam (Gambhir) is aware of our plans. Mumbai Indians are going to retain their skipper Rohit Sharma and Pandya Brothers. Krunal Pandya being an uncapped player will be retained only for Rs. 3 crore; which will be a good deal for Mumbai Indians. Rajasthan Royals returning as Royals after two years is going to retain Australian skipper Steve Smith. While there are also chances of retaining inform Indian batsman Ajinkya Rahane. For Royal Challengers it is quite an easy choice to make, they are retaining their skipper Virat Kohli along with South African batsman AB de Villiers and Yazuvendra Chahal. David Warner and Shikhar Dhawan are Sunrisers Hyderabad’s first two choices. For the third name, the franchise may be confused, as to go with Bhuvneshwar Kumar or Afghanistan's leg-spinner Rashid Khan or uncapped Vijay Shankar. Bhuvneshwar Kumar has been the lead bowler for SRH, on the other hand, Rashid Khan was exceptional during the 10th season of IPL and is one of the good leg-spinners in T20 world cricket. Vijay Shankar had a good season for Tamil Naidu and was selected for the Test series against Sri Lanka, but was not included in playing XI. Being uncapped SRH may go for Vijay Shankar as it will only cost Rs. 3 crores. While it will be important to see if Yuvraj Singh can make the place in the retention list of SRH or will be put under the hammer and later use RTM card.